Ark. Lt. Gov. Tim Griffin and UCA President Houston Davis (center) cut a purple ribbon at the grand opening of the new Arkansas Coding Academy campus Thursday. They are joined by several UCA Board of Trustees members and employees. 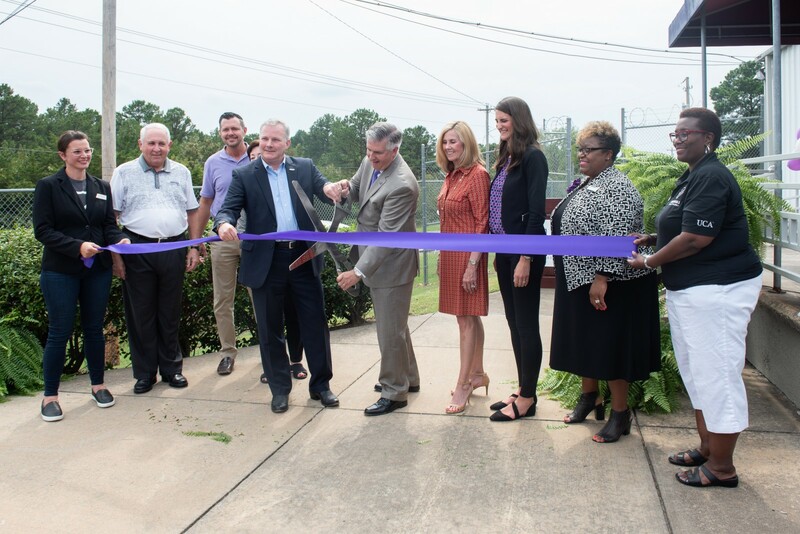 The University of Central Arkansas Department of Outreach and Community Engagement celebrated the grand opening of the new Arkansas Coding Academy campus with a ribbon-cutting ceremony Thursday. Arkansas Lt. Gov. Tim Griffin was a special guest speaker at the ceremony. “The Arkansas Coding Academy is the perfect example of local entities – UCA, the Chamber of Commerce and businesses – partnering to meet the needs of employers, ” Griffin said. The new campus offers students and employees two classrooms, dedicated study and break areas, expanded office space and 24-hour access to the facility. It is the culmination of work to create a space more conducive to the learning needs of the students. Currently, there are 15 students enrolled in classes, and enrollment is underway for the next cadre of developers. “We’re both honored and privileged that the university has invested in and entrusted us with the new space. It ensures our growth and success, and we can’t wait to see what’s next,” said Mary Condit, director of the Arkansas Coding Academy. To help students continue their education in software and app development, the Arkansas Coding Academy has partnered with ARCodeKids, an initiative that provides scholarships to working adults to defray the cost of tuition. “We are excited to continue our partnership with ARCodeKids to offer scholarships for adult learners looking to improve their development,” said Condit. Additionally, the coding academy grants partial scholarships to women and veterans. Financial assistance is also available through the Arkansas Student Loan Authority.